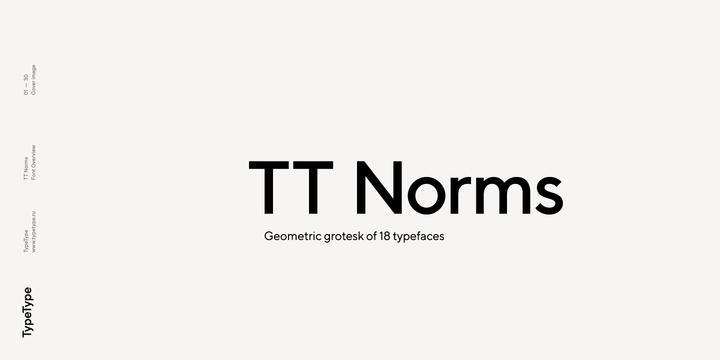 TT Norms is a modern geometric grotesque typeface created by Ivan Gladkikh together with TypeType Team and published by TypeType which is available in 9 weights (from Thin to Heavy) and true italics. It includes a big pack of OpenType features, solid forms working great on both for headlines and body text, and support more than 70 languages. The feature shifts varios punctuation marks up to a position that works better with all-capital sequences. It includes the alternative glyphs set. Cannot miss it! Price: starting from $29,00 for one font to $145,00 for all 18 fonts. A font description published on Tuesday, June 27th, 2017 in Fonts, Ivan Gladkikh, TypeType, TypeType Team by Alexandra that has 4,057 views.